This is my first attempt at writing a blog post from the platform of my smartphone. As I wade into the summer time and am more frequently removed from my computer and readily-available Internet, I find myself grateful to have this portable little device. Summer has also brought with it even more time for hiking outdoors. A few local natural areas (among them Huron Natural Area and Dryden Tract) exhibit a notable trend in the landscape. 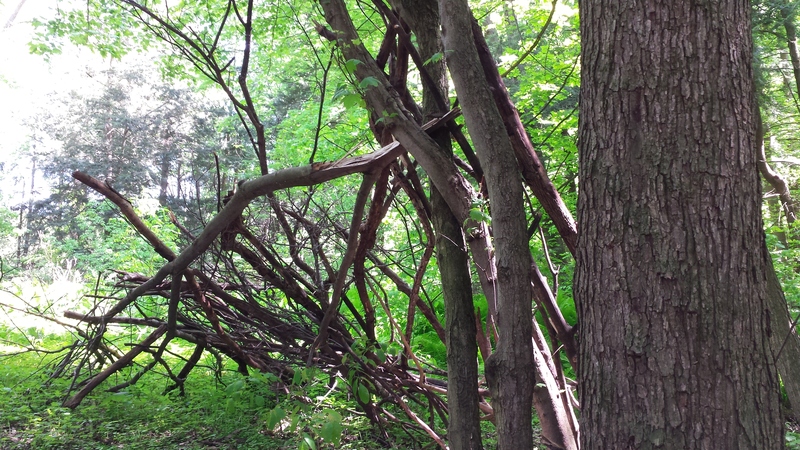 People have gathered together random assortments of sticks and piled them against low-hanging branches to build miniature forts in the middle of the woods. The woods are not an open place, shaded as they are from sun and wind – yet, curiously, people still feel the need to assert their requirements for structure, habitat, and form within the wildness of the forest. These structures are both beautiful and anonymous. It’s a kind of discursive regime. Each creation will stand for many years, until the wood rots or slips from its perch. The original creator has likely long moved on and lost interest. Every person who walks by a stick fort will wonder, though, who the creator was and why they took the time to form such a hideaway. Were they in legitimate need of shelter? None of the forts I noticed had the marks of actual human habitation. Instead, they looked like a symbol or a representation – of our human need for safety, comfort, and shelter within the woods (which are tamed only in our imagination. We may hike through the woods during the day for recreation, but night sees the affluent members of our society back snug under a roof somewhere). I include a few images of these intriguing structures, below. This is really quite cool. Is this akin to making a pile of rocks or something? Is this pretty common up there? A recent phenomenon? I thought you might enjoy these pictures, Robert! I think it is very much like making a pile of rocks, which are most commonly in the form of Inukshuks around here (see: http://members.shaw.ca/northernlitehikers/inukshuks.htm). 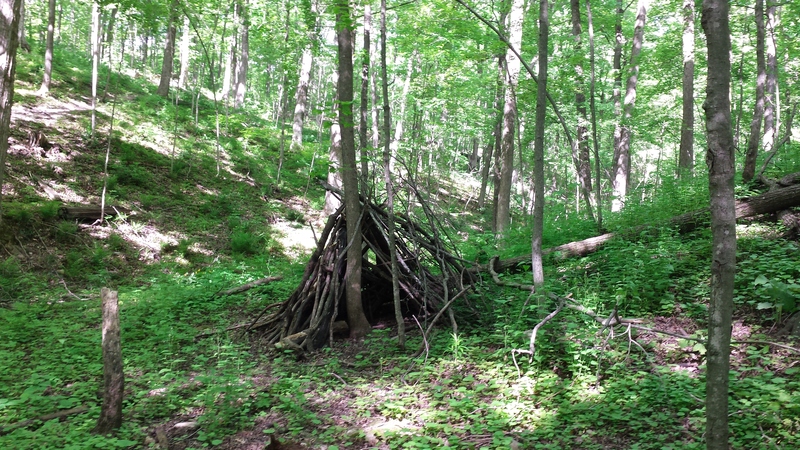 I would say that, over the course of my lifetime, I have always seen sticks piled up into little forts in forests. Thus, I would say that it is pretty common, but not very recent. 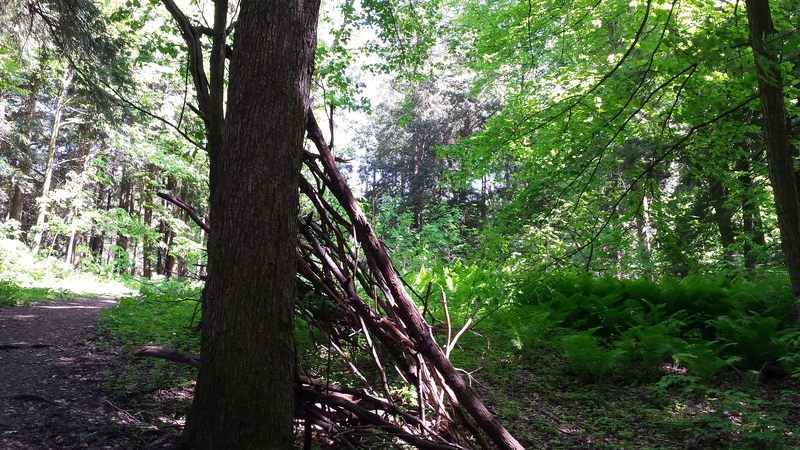 I recall making a fort of my own as a child, hidden away in a stand of cedars near my family’s cottage. The fun part was constructing the fort with my Mom and brother….almost immediately afterwards I lost interest in it. I walked by the stand of trees every year though – I felt pride when I saw the fort still standing. Recent construction and development work has caused it to collapse (sadly). That is really fascinating to me as I have NEVER heard of this activity before. Very cool and thanks again for sharing.